After months of searching, researching, online, offline and everywhere in between… I finally found the right “treatment” for my fireplace mantle. These birch branches were an accidental discovery at Crate and Barrel while I was shopping for Holiday decorations. Going on my gut, I took a chance with three branches, not sure if the length and proportion would work. After mocking it up here I had my handyman install them in the wall and am in love with the final result! And just in time to hang our XMAS stockings! After a few fits and starts finding the right materials and stair installation company, I’m finally seeing my cable rail system come together! 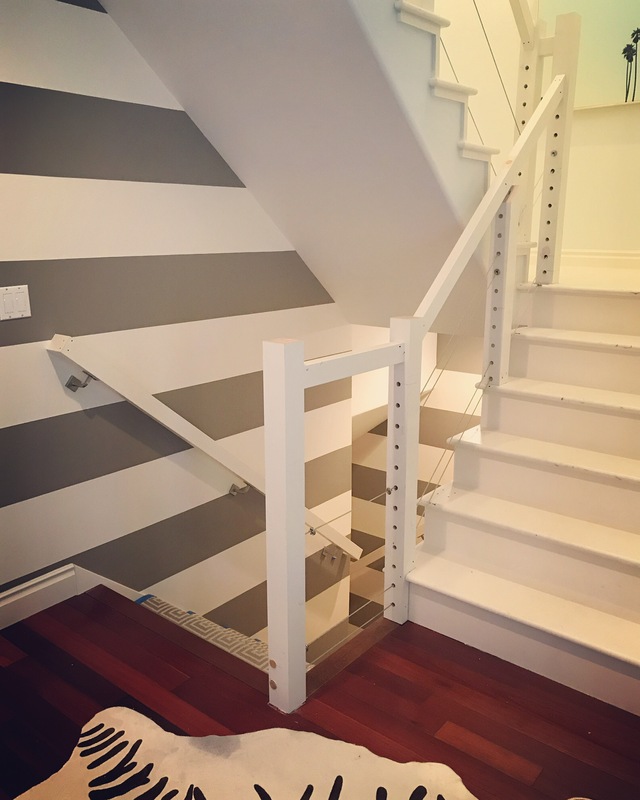 These in-progress pics will give you a glimpse into the look I wanted to achieve, clean and modern with an airiness that will lighten up my small space. Re-doing the stairs was a huge learning process, which started in June! I discovered how incredibly specialized this area is. There are only a handful of qualified cable rail installers in the Bay Area and since they’re so scarce they charge a premium and treat you like you’re lucky to be getting their service. One company actually turned down my job! But when it’s all done I think it will all have been worth it. 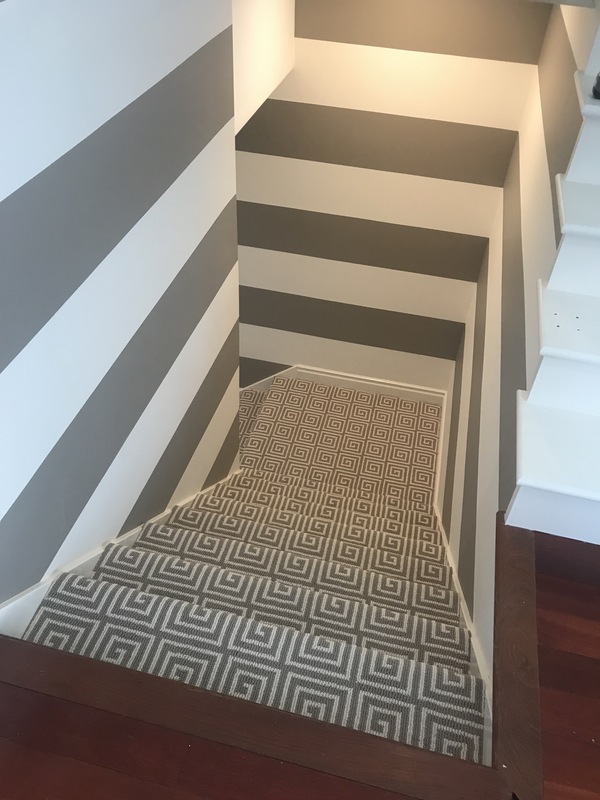 Just a few more steps to a complete transformation…I have to repaint the stairs, hang a light fixture in the landing and install the carpet runner. Final pics to come soon! 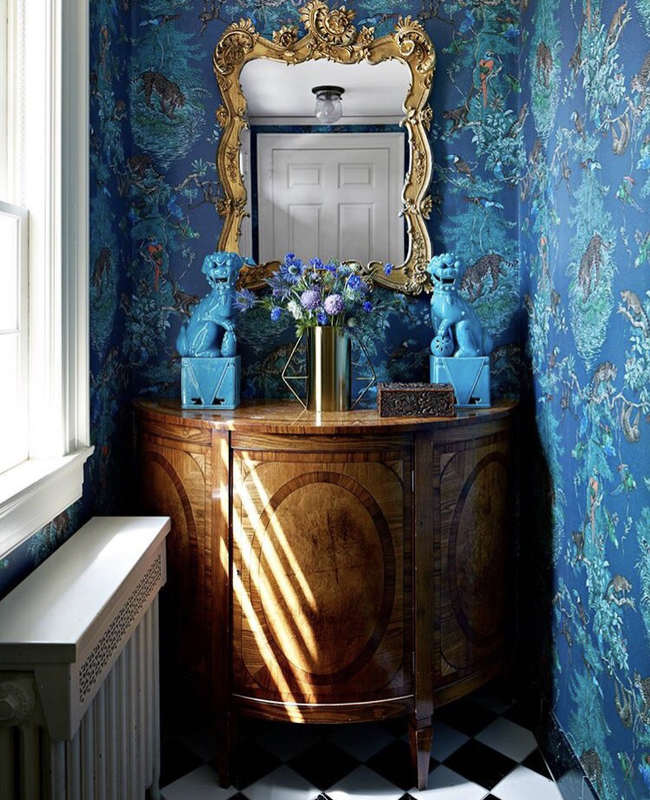 LOVING this entryway designed by Janet Gridley. The combination of saturated blues in the wallpaper and high gloss ceramic foo dogs says WELCOME in such a bold, elegant way. It’s also comforting to have the symbolic foo dogs protecting your entryway. In the Chinese tradition, they are placed in pairs — one is female, the other is male. The female represents yin, and symbolically protects the people dwelling inside the home, while the male statue, representing yang, protects the structure itself. You can find lots of foo dog fun facts on Houzz. Thank you Janet for the inspiration, I’ll be using my own set [a flea market find in Rome] as the centerpiece in my new and improved powder room. Leaves are turning and there’s a chill in the air. Fall has officially arrived in San Francisco! This is absolutely my favorite time of year. It’s when I bring out the cedar and fir scented candles [“Fir and Firewood” from Anthropologie is the BEST], throw fur blankets everywhere, dust off the holiday decorations, and pull my UGG boots and cozy sweaters out of the closet. 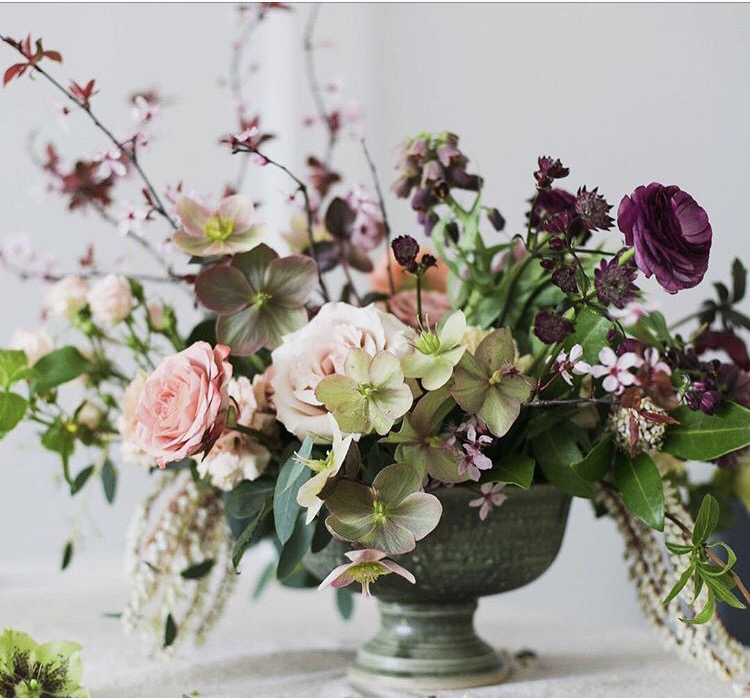 It’s also the time for Fall florals with a gorgeous new palette of colors like his arrangement overflowing with Ranunculus, Orchids, Garden Roses and Eucalyptus. It’s the perfect blend of acid greens, oxblood, blush and persimmon. So inspired by this arrangement, I’m going try my hand at replicating it for a centerpiece in my dining room. Will post a pic of what I come up with, wish me luck! 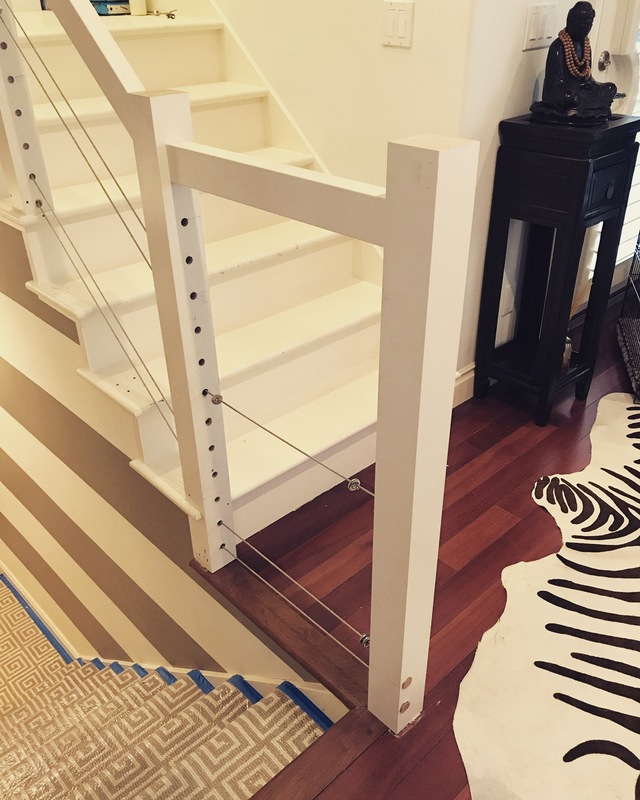 Home projects continue…installing the stair carpet! 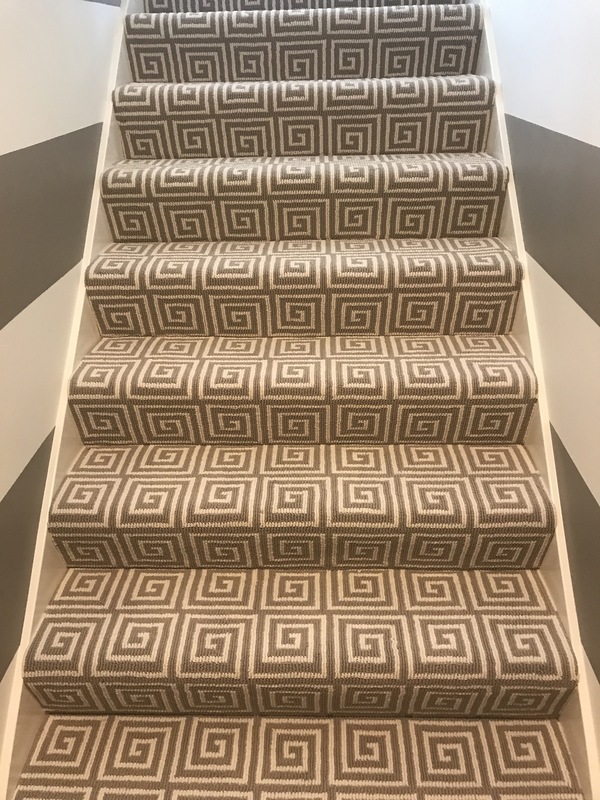 I’ve always been a fan of pattern on pattern (on more patterns), which is why I’m so happy with the way my new carpet looks in the entry stairway! IN LOVE with the way the Pioneer Key pattern in “Dusk” plays off the taupe-on-taupe striped walls. 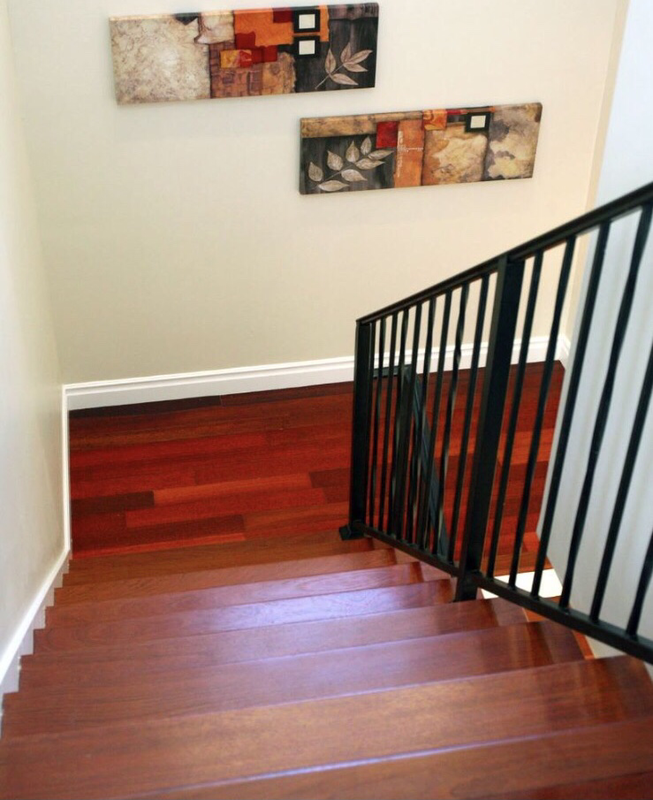 Together they transform the entryway into a bold WELCOME, while adding warmth and comfort that feels so nice under your feet! The carpet is the Atelier line from Stanton Carpet and paint from Benjamin Moore. 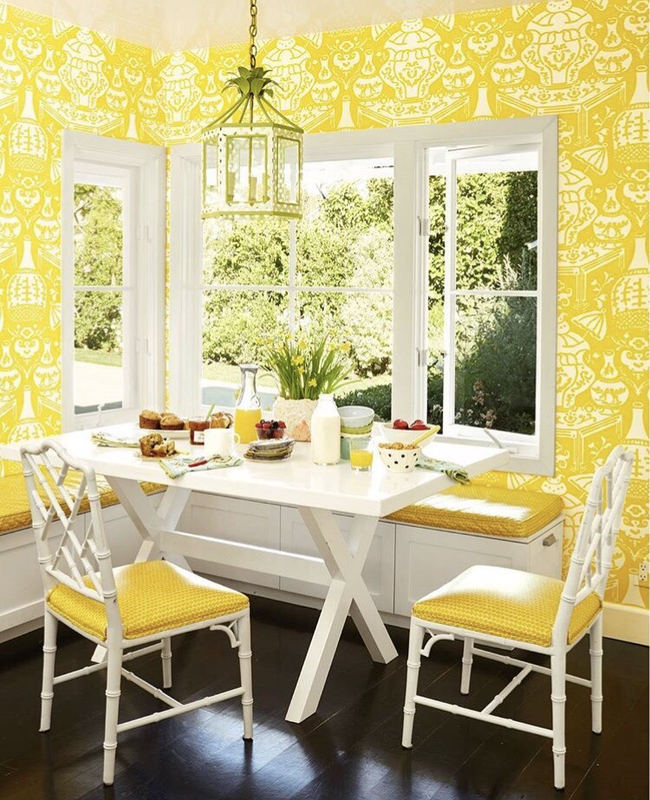 I cannot get enough of color and these breakfast nooks bathed in bright shades of yellow just shout HAPPINESS! Also LOVE this kitchen nook with banquette and built-ins designed by Lindsey Coral Harper. I mean, where do I start?! 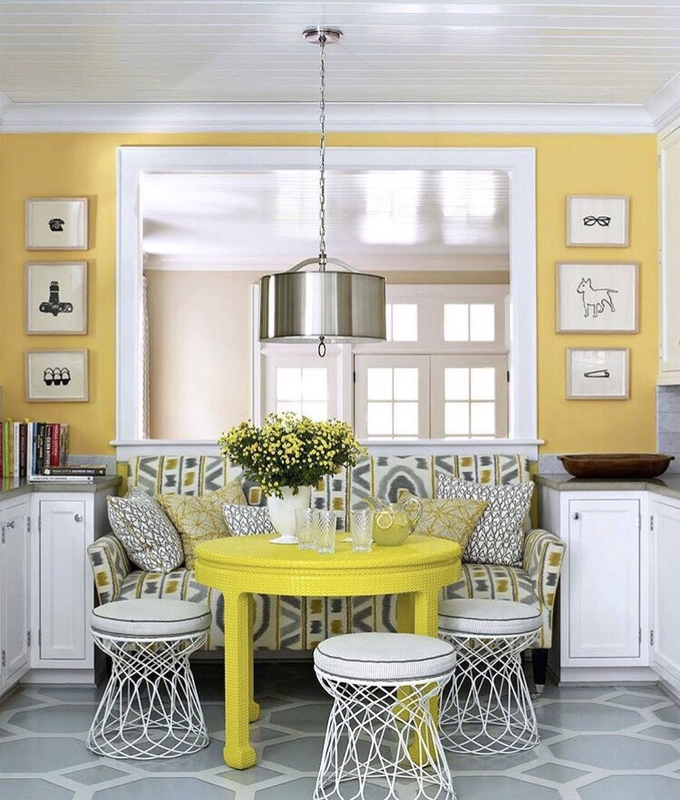 The over-sized pendant light fixture with drum shade, the round table and upholstered round stools create a through line for the eye, with multiple shades of yellow popping here and there, making this space sheer perfection! 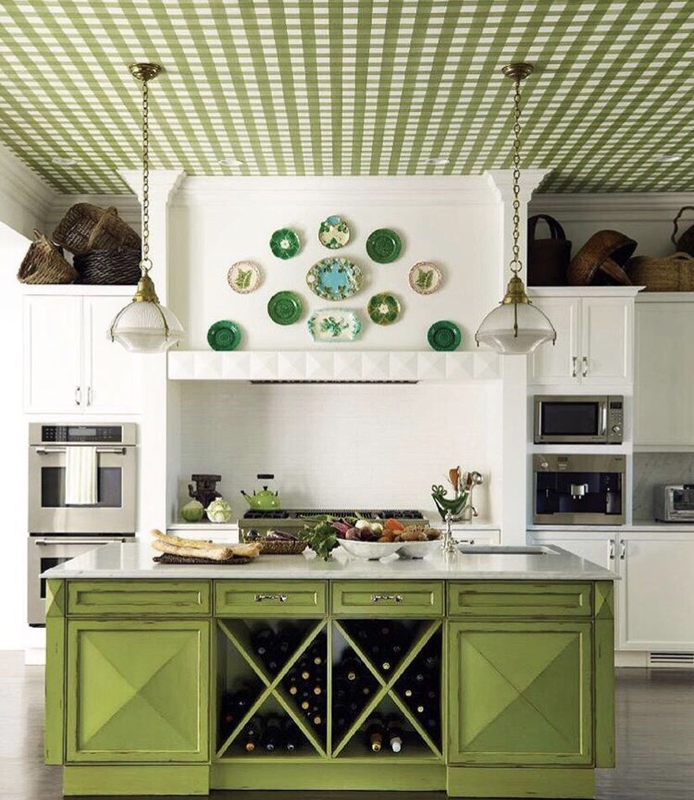 I’ve always been obsessed with the color Green (inherited from my mother), but this Granny Smith apple green island and gingham ceiling from Gideon Mendelson is nothing short of genius. And you can never go wrong with a tableau of plates to tie it all together. Don’t you agree? !